That’s All Bub Tee Design Review. 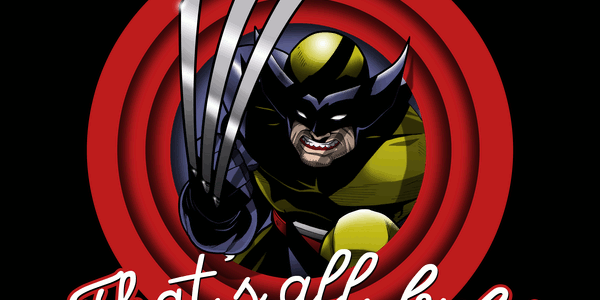 The That's All Bub tee design is for the Wolverine fans that enjoy Looney Tunes. The concept is simply a parody of the "That's All Folks" in the closing credits of the Warner Bros. Loony Tunes Cartoons (Shown below) featuring Wolverine and his love of calling people "Bub". As for the artwork, it is more detailed than the Looney Tunes cartoons that's for sure. The shading is above and beyond that which is put into most t-shirt designs especially from the Claw's as cast on Wolverine's face and fist. The foreshortening of the claws is another aspect of the art skill. The colors are appropriate for both franchises. The only questionable part is the red stroke around the design that is only seen on one of the claws, as it seems the claw would stand out on any background even without that effect. I can only assume it is there in case someone chooses the Silver colored fabric. Any color looks fine. Although it would be nice if there was a fabric color to match the Blue that is inside the Red rings. This That's All Bub tee will make a great gift for older Wolverine, Weapon X and X-Men Fans, kid's these days may not get the Warner Bros. reference. This design is ideal to wear to Comic-Cons. That's All Bub Tee Design by ClayGrahamArt .